DO I NEED TO ASSEMBLE THE FRAME? No, the frame is already assembled. You will need to attach the roof to the frame. DO YOU SUPPLY JUST THE MARQUEE? No, we can supply all of the accessories required. WHY DON’T YOU ATTACH THE ROOF TO FRAME? The marquee must be stood upright during transit if the roof is attached. If your marquee needs to be positioned horizontally you MUST remove the roof to prevent damage. Using delivery companies we cannot guarantee that a marquee order will be stood upright while in transit. WHAT IS THE DIFERENCE BETWEEN THE FRAMES? The 32mm Terrain is the perfect entry level marquee, ideal for personal use on a tight budget. The steel frame is light and easy to set up with using a polyester roof. The Horizon 37mm is proven and popular with schools, charities, sports clubs and child care centers. Regular campers, motorsport enthusiasts and pit crews and market stallers appreciate the design and value of the Horizon 37mm range. The Panorama 40mm has been the choice for thousands of corporate marketers, SME business buyers, sporting clubs, larger school customers and regular market stall operators. Yes, both of our fabrics are waterproof. CAN I CHOOSE THE COLOUR OF THE ROOF? Yes, we have 8 standard colours in the Polyester range and 10 standard colours in the PVC range. CAN I PRINT ANYTHING ON THE ROOF? Yes, we can print anything and everything! 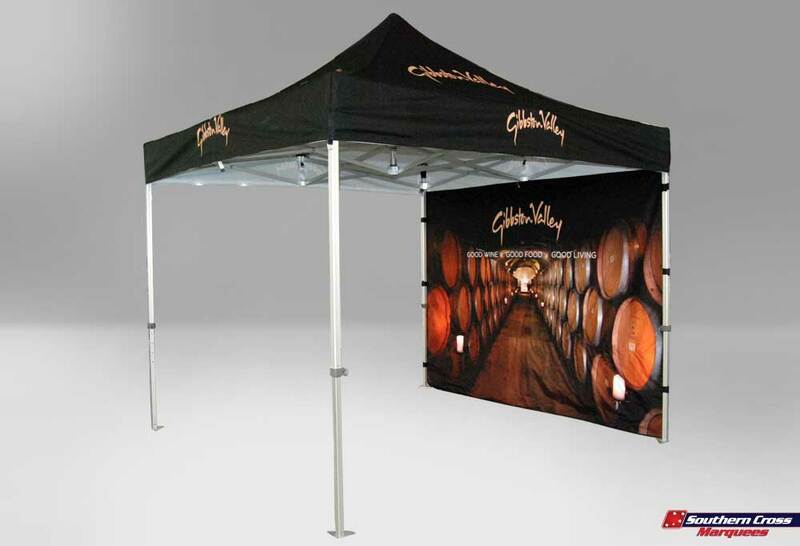 All of our custom canopies are printed using the latest digital printers and we can print anything from logos, text, company colours, photographs, gradients, textures. The only colours we are unable to print are fluro and metallic colours. We require EPS or PDF artwork files for logos and we recommend photographs to be supplied at a minimum of 300DPI at roughly A4 size. IS A MARQUEE EASY TO SET UP? Yes, our marquees are very easy to set up! We always recommend having two people to set up and pack down any of our marquee ranges. CAN I SET MY MARQUEE UP IN ALL WEATHER CONDITIONS? Marquees are designed as temporary shelters. Do not leave up for extended periods of time.Do not leave your marquee unattended. Yes, our marquees come with the following accessories; sandbags to be secured on hard surfaces and steel pins to be secured on soft surfaces. CAN YOU DELIVER TO MY HOUSE, BUSINESS OR CLUB? Yes, we deliver Australia wide using freighting companies. WILL I RECEIVE MY ORDER ALL AT ONCE? When we package your order to be freighted most orders will have multiple boxes, containing the individual parts of your marquee. We tend to find freighting companies deliver the smaller lightweight boxes first and the larger, heavier boxes can take slightly longer to arrive, as they require a larger truck. When cleaning your marquee canopy (roof,walls or valance panels) use a soft mop and any mild household cleaning fluid such as dish-washing detergent in warm water.When cleaning the roof canopy of your marquee we recommend that the marquee is fully opened and secured into position. DO NOT EXTEND THE LEGS. This will avoid the necessity of using a ladder or extension poles.We recommend that the roof of your marquee should be cleaned regularly depending on frequency of use.Allow your marquee to completely dry before packing down and fitting the protective cover, this will prevent mildew. Ensure all protective covers are clean and dry before fitting to any of your marquee products. ARE SPARE PARTS AVAILABLE FOR YOUR MARQUEES? Yes, if you require any spare parts you can either contact our warehouse manager via the Spare Parts Page on the website or by calling our office.